In this study, one-dimensional (1D) zinc oxide was loaded on the surface of cobalt oxide microspheres, which were assembled by single-crystalline porous nanosheets, via a simple heteroepitaxial growth process. This elaborate structure possessed an excellent transducer function from the single-crystalline feature of Co3O4 nanosheets and the receptor function from the zinc oxide nanorods. The structure of the as-prepared hybrid was confirmed via a Scanning Electron Microscope (SEM), X-ray diffraction (XRD), and a Transmission Electron Microscope (TEM). Gas-sensing tests showed that the gas-sensing properties of the as-designed hybrid were largely improved. The response was about 161 (Ra/Rg) to 100 ppm ethanol, which is 110 and 10 times higher than that of Co3O4 (Rg/Ra = 1.47) and ZnO (Ra/Rg = 15), respectively. And the as-designed ZnO/Co3O4 hybrid also showed a high selectivity to ethanol. The superior gas-sensing properties were mainly attributed to the as-designed nanostructures that contained a super transducer function and a super receptor function. The design strategy for gas-sensing materials in this work shed a new light on the exploration of high-performance gas sensors. Metal oxides, as a type of predominant gas sensing material, have provoked considerable attention because of their low cost, excellent electrical properties and controllable preparation (Korotcenkov, 2007; Li et al., 2016; Dong et al., 2018). It is well accepted that the gas-sensing processes of metal oxides, contain not only gas diffusion and gas reaction on its surface, but also signal transformation that transforms the surficial chemical signal into an electrical resistance variation (Rai et al., 2013). In this regard, gas-sensing performances of metal oxides depend largely on the structure factors of sensing materials such as surface area, morphology, as well as signal transmission channels (Zhu et al., 2018). Nowadays, many studies have reported that the gas-sensing properties of metal oxides can be improved by the creation of heterojunctions, which can provide tunable morphologies and compositions (Miller et al., 2014; Cao et al., 2017; Gong et al., 2018). For example, the In2O3/Co3O4 composites synthesized by Mirzaei et al., exhibited superior gas-sensing performances than pristine In2O3 did (Mirzaei et al., 2017). However, up to now, most related studies have been based on mechanical mixed composites or inhomogeneous structures, resulting in randomly distributed heterojunctions. In particular, the gas-sensing processes of composites that contain gas diffusion, gas reaction, and signal transformation still need to be further improved. 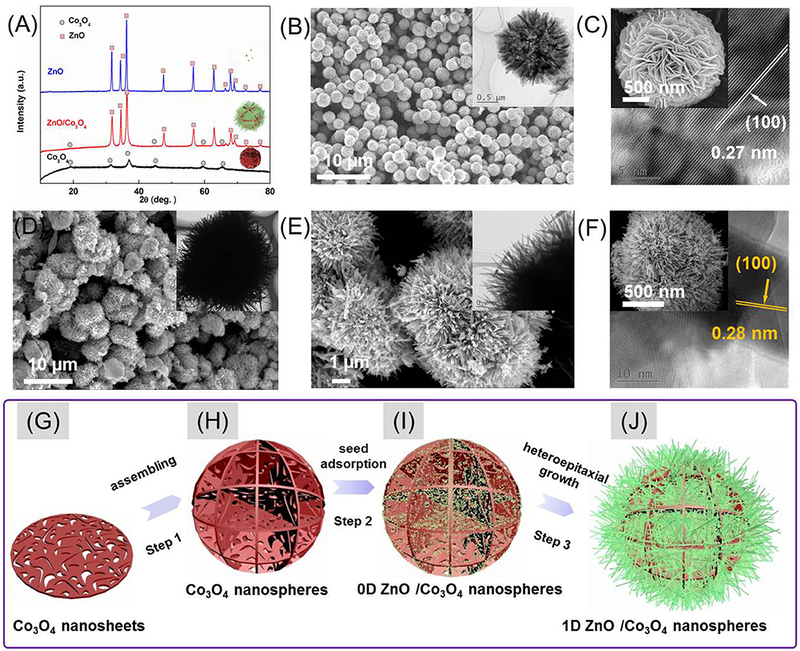 In this paper, ZnO nanorods anchored on the surface of Co3O4 nanospheres were synthesized by an epitaxial growth method. ZnO and Co3O4 have been widely investigated in the field of gas-sensing application, because of their chemical and physical stability and abundance in raw materials (Tan et al., 2017; Zhu and Zeng, 2017). We chose the ZnO nanorods and Co3O4 microspheres because of their large surface area for gas reaction and because of the effective accesses for gas diffusion (Park et al., 2016). Moreover, the Co3O4 nanospheres consisted of single-crystalline porous nanosheets which provided effective electrical pathways for charge-carrier transfer and was more beneficial to the signal transformation process (Singh et al., 2011; Zhang et al., 2015). Therefore, these ZnO nanorods acted as “trigger hairs,” while Co3O4 microspheres acted as “channels.” And the p-n heterojunctions between ZnO and Co3O4 also led to an extended depletion region and a high initial resistance, which is more beneficial for the transducer function (Li et al., 2015). All the chemical reagents were purchased from Sinopharm Chemical Reagent and used without further purification. During the synthesis processes (Xu et al., 2017), a mixed solution (80 ml) composed of distilled water and ethylene glycol (1: 79) was added at 0.05 g PVP, as well as 1 g cobalt acetate. The mixed solution was then stirred and poured into a Teflon-lined stainless-steel autoclave (100 mL). The resulting precipitate was collected and washed repeatedly at least seven times and thereafter maintained at 180°C for 12 h. The final powder was then annealed at 350°C for 2 h in air atmosphere. To prepare the ZnO/Co3O4 hybrid, 0.03g as-prepared Co3O4 and 0.32 g zinc acetate dehydrate was added in methanol through the assistance of ultrasonication. A KOH methanol solution (60 ml) was then also added to the above mixture. After 2 h of stirring, the mixture was centrifuged at 3,000 rpm and washed several times. The powder obtained, was then was added into a mixed solution composed of Zn(NO3)2 (0.89 g) and HMT (0.42 mol/L) by vigorous stirring. The final as-designed hybrid was obtained after being refluxed at 95 °C for 6 h.
where Q (ml) is the liquid volume of the volatile compound, V (ml) is the volume of the testing chamber, ϕ is the required gas volume fraction, M (g. mol−1) is the molecular weight, d (g. cm−3) is the specific gravity, and ρ is the purity of the volatile testing liquid, TR and TB (°C) are the temperatures at ambient and the test chamber, respectively. For example, the liquid volume of ethanol is calculated at about 13.05 μL that corresponds to 100 ppm. Two electric fans installed in the chamber were used to make the test gas homogeneous. After a few minutes, the chamber was lifted to introduce ambient air (humidity: 16~22%). In the meantime, the resistances of the sensors were recorded by a personal computer. The crystalline phases of as-prepared samples were characterized by XRD (Figure 1A). As can be seen, beside the peaks that belong to Co3O4 (JCPDS No. 42-1467), all the diffraction peaks left in the pattern of hybrids can be indexed to the reflections of ZnO (JCPDS No. 36–1451).The morphology of Co3O4 is shown in the Figures 1B,C. It is seen that the Co3O4 is composed of numerous uniform microspheres with a diameter of 2–4 μm. These microspheres are composed of many crossed 2D nanosheets with numerous pores, as shown in the enlarged images (Figure 1C). It is worth mentioning that the individual nanosheets containing numerous pores are single crystals, since each nanosheet consisted of coherent lattice fringes regardless of the pore in the inset of Figure 1C. The single crystal can provide effective electrical pathways for charges, which benefits the gas-sensing performances (Meng et al., 2015). Accordingly, the morphology of ZnO/Co3O4 was also characterized (Figures 1D–F). Figure 1D reveals that the ZnO/Co3O4 hybrids were also composed of numerous microspheres. However, its diameter was much larger than that of pristine Co3O4. The enlarged images (Figures 1E,F) reveal a hedgehog-like structure of ZnO/Co3O4 where ZnO nanorods were formed on the surface of Co3O4 as trigger hairs. The ZnO/Co3O4 hybrids were further characterized through EDS (Figure S1). Only O, Zn, Co, together with C elements were detected. The average atomic ratio of Zn and Co was about 1:6.5. The distributions of O, Zn and Co are presented in Figures S1A–D. It was revealed that the elements O, Zn, and Co were distributed homogeneously. 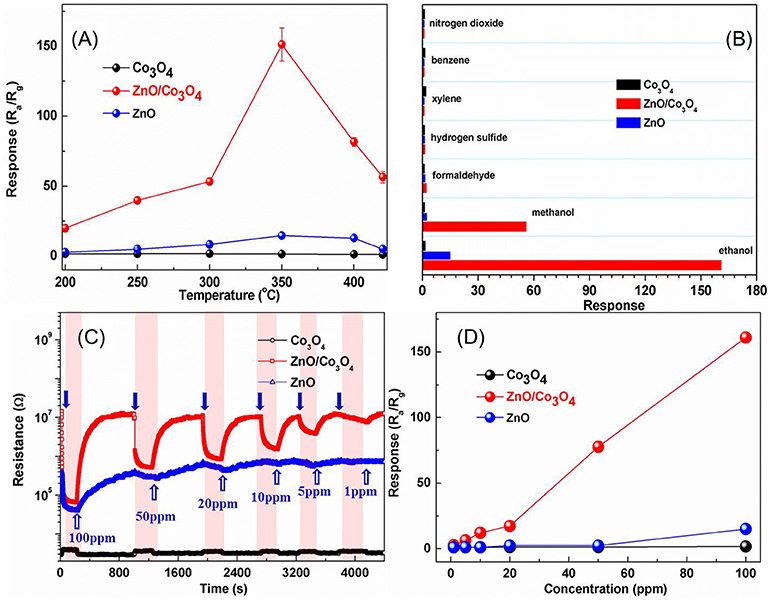 The growth processes of ZnO on the surface of cobalt oxide were displayed under different time conditions as shown in Figure S2. The preparation processes of ZnO/Co3O4 are thus illustrated in Figures 1G,H. As seen in step 1, the as-obtained Co3O4 microspheres are composed of many single-crystalline porous nanosheets. These Co3O4 microspheres were then anchored with ZnO crystal seeds by soaking them into a pre-prepared ZnO colloid solution as shown in step 2 (Figure 1I). Finally, via a heteroepitaxial growth process, ZnO nanorods were grown on the surface of Co3O4 microspheres (Figure 1J). Figure 1. (A) XRD spectra of Co3O4, ZnO, and ZnO/Co3O4. (B,C) SEM and TEM (inset) of Co3O4. (D–F) SEM and TEM (inset) of ZnO/Co3O4. (G–J) Schematic illustration of the formation processes of ZnO/Co3O4 hybrid. The responses of these sensors to 100 ppm ethanol at different operating temperatures are shown in Figure 2A. It can be observed that the optimal operating temperature is 300°C for ZnO/Co3O4. The response was about 161 (Ra/Rg) to 100 ppm ethanol, which is 110 and 10 times higher than that of Co3O4 (Rg/Ra = 1.47) and ZnO (Ra/Rg = 15), respectively. Gas-sensing tests of ZnO/Co3O4 toward other gases (100 ppm) were carried out as shown in Figure 2B. It was found that the responses to ethanol was much higher than to other gases. This could be due to the different volatilities and chemical properties of gases, which prompt the sensors to exhibit different adsorption and catalytic performances toward them. Therefore, the polarity, molecular weight and structure of these gases can exert great effect on the gas-sensing response. The difference between ethanol and methanol in this work may be the molecular weight. Alcohol with larger molecules can be more easily adsorbed and can release more electrons. On the other hand, different constituents and structures with various surface properties are also believed to influence the selectivity of sensing material, due to the diverse chemisorption abilities, which induce different selectivity behaviors between Co3O4, ZnO/Co3O4, and ZnO. The responses to 1~100 ppm ethanol were tested as shown in Figure 2C. Evidently, exposure to ethanol gas led to an increase in resistance for Co3O4, while it led to a decrease for ZnO and ZnO/Co3O4, indicating that Co3O4 exhibits a p-type semiconducting behavior while ZnO and ZnO/Co3O4 exhibits an n-type behavior. Figure 2D present the responses of Co3O4 and ZnO/Co3O4 as a function of the ethanol concentrations (1–100 ppm), from which the gas responses increase almost linearly with the gas concentration. Figure 2. (A) Responses of Co3O4, ZnO, and ZnO/Co3O4 microspheres to 100 ppm ethanol at different operating temperatures. (B) Responses to different gases with a concentration of 100 ppm. (C) The dynamic gas response patterns to ethanol with different concentration. (D) The response as a function of concentration. The real-time responses of Co3O4, ZnO, and ZnO/Co3O4 to 100 ppm ethanol with three cycles are displayed in Figure S3. The resistance patterns reveal the similar continuous recycles, indicating all of the samples exhibit good repeatability. The response and recovery time are also important parameters in the fields of gas detection. It was revealed that the response time of Co3O4, ZnO, and ZnO/Co3O4 are 6, 17, and 13 s, respectively. And the recovery times of Co3O4, ZnO, and ZnO/Co3O4 were 12, 405, and 168 s, respectively. The fast response and recovery of Co3O4 can be attributed to its single-crystalline porous structure which benefits the gas-diffusion process and charge-transfer process. Compared with pure ZnO, the response and recovery process of ZnO/Co3O4 were accelerated because of its super single-crystalline porous structure. In addition, the response and recovery speeds of ZnO/Co3O4 to ethanol with low concentrations was much faster than those in ethanol with high concentrations, because of the slow diffusion speed of ethanol molecules to the active site at a low concentration. The excellent gas-sensing properties of the ZnO/Co3O4 to ethanol, are mainly due to the many benefits of the as-designed structure. First, the ZnO nanorods and Co3O4 microspheres provide numerous channels for gas diffusion and an extremely high surface area for gas reaction. Furthermore, the single-crystalline feature of Co3O4 nanosheets provides a fast transport of charge carrier, another main factor to improve the signal transformation process of a hybrid. Moreover, the p-n heterojunctions between ZnO and Co3O4 can enlarge the response signal. Because the conduction band edge of Co3O4 is more negative than that of ZnO, band bending, and depletion regions are formed at the heterojunctions (Jana et al., 2015). By increasing the initial resistance, due to the as-established depletion region, the modulation of resistance will become more evident (Kim et al., 2017). In this paper, ZnO nanorods anchored on the surface of Co3O4 nanospheres were synthesized. ZnO nanorods and porous Co3O4 microspheres provided numerous channels for gas diffusion and a large surface area for gas reaction. The Co3O4 nanospheres consisted of single-crystalline porous nanosheets to provide effective electrical pathways for charge-carrier transfer. And the p-n heterojunctions between ZnO and Co3O4 also led to an extended depletion region and a high initial resistance. As expected, this as-designed hybrid exhibited excellent gas-sensing properties with an extremely high response (Ra/Rg = 161) and a high selectivity to ethanol. HZ performed the experiments and analyzed the data with the help from YY, TY, CY, WW, YS, and WL. KX wrote the manuscript with input from all authors. All authors read and approved the manuscript. This work was supported by the National Natural Science Foundation of China (Grant No. 51461019, 51661012, 51761017, 51702140, 51602134, 61664005). Copyright © 2018 Zhou, Xu, Yang, Yu, Yuan, Wei, Sun and Lu. This is an open-access article distributed under the terms of the Creative Commons Attribution License (CC BY). The use, distribution or reproduction in other forums is permitted, provided the original author(s) and the copyright owner(s) are credited and that the original publication in this journal is cited, in accordance with accepted academic practice. No use, distribution or reproduction is permitted which does not comply with these terms.